The primary question that the EU, and the rest of the world has yet to address, never mind answer, is whether Islamic culture and European (read Christian) culture can productively co-exist or whether we even want it to. Can we create a secular state where religion can play a central role in a person’s life, but not be part of the government to which he belongs? 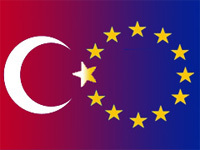 If we believe the answer is yes, then there is no doubt that Turkey has what it takes to be part of the EU. The EU guidelines are a great power for good; they spread democracy, social institutions and transparency without guns or micro-management. The old European fashion of colonialism was effectively a heavy-handed way of introducing European style institutions into a foreign culture. The EU guidelines allow for a more macro approach. Guidelines and end-goals are set, and the countries that wish to join the EU must find their own methods of reaching the goals. This allows for stable nation building, which avoids many of the weak links in armed or colonial approaches. It takes longer, but it also lasts longer and penetrates deeper into society. The improvement of eastern European governments over the past 15 years is largely due to their adoption of EU standards with regards to government, social issues and business practices. I believe this same method can be used to help Turkey become a secular, stable state with an Islamic population. Turkey would then act as a model for other Islamic societies. It is evident that the heavy-handed approach in Iraq will not work; as such, we must re-think our approach to helping Islamic states modernize. My recent trip to Turkey was very illuminating. To be completely fair, I did not speak Turkish and I only travelled to the most modern parts of the country. Tales from other travellers I met described eastern turkey as a truly third world area with little to no modern infrastructure. However, the situation in China – through which I travelled extensively – is not very different and yet they are progressing towards modernization at an astounding pace. One major issue that still hangs over Turkey, is their freedom of speech and their denial of the Armenian Genocide. It is necessary that Turkey take responsibility for their actions during WWI with regards to the Armenians. Their apologies must be whole-hearted and on a scale similar with those of post-WWII Germany and then they must be integrated into the Turkish education system. A cleansing of the Turkish conscience and a demonstration of their ability to be transparent is absolutely imperative if they have any hope of joining the modern world, let alone the EU. Of course, their potential membership with the EU will not come overnight; it will likely take 20 years. I was really impressed with Turkey, its people and the general atmosphere. They were much more European than I expected. The question that remains to be resolved is whether Islam and Christianity can peacefully co-exist. The adhesion of Turkey would dramatically shift the demographics of Europe. Can such vast quantities of people come to agreements in an open government forum or do we need to separate them as is done in Israel. If we believe in their compatibility, then I think Turkey has a legitimate case at entering the EU and the EU has a fantastic method of modernizing foreign nations without direct intervention.